In case you are not familiar, Accutane (or oral isotretinoin) is a retinoid that is derived from vitamin A that alters the lipid composition of the skin surface by reducing the size of sebaceous glands and lowering sebum production (a major contributor to acne). This reduces the bacterial skin microflora that cause acne flare-ups. This drug puts patients through a lengthy and often overwhelming experience as patients typically take isotretinoin for 15 to 20 weeks. It permanently clears acne for roughly 80% of acne patients, although for the remaining 20% breakouts may return later in life. While taking isotretinoin, most patients may experience side effects such as purging of the skin (breakouts caused by the transformations taking place within the sebaceous glands), severe dryness of the lips, skin and eyes, and may also encounter abnormal liver function and a potential increase in triglycerides and cholesterol. 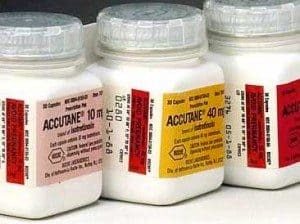 Among the most serious side effects of Accutane, some patients may encounter liver inflammation, elevated risk for birth defects (if a woman were to get pregnant while taking oral isotretinoin), and Irritable Bowel disease. 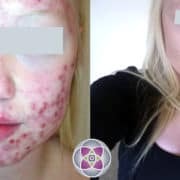 With all of these side effects, it is shocking to think that one would want to take on these kinds of risks just to be free of acne, but what we must understand is that for most cystic acne sufferers there is no price tag or risk too great for clear skin. With the reign of Accutane and its side effects fading into the past, it is quite the question…….what are acne sufferers to turn to? 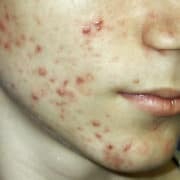 ARE THERE SAFER TREATMENTS AVAILABLE FOR ACNE SUFFERERS? Without challenging your health, the answer for a safer and more holistic type of acne treatment is quite simple. 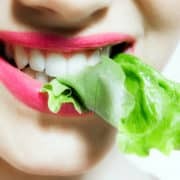 Laser Acne Treatment is a gentle and effective means for treating acne along with all of the other problems that arise within the skin when acne is present. 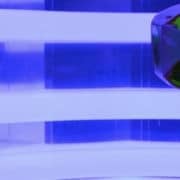 Acne treatments require specific lasers, which target the bacteria that are infecting follicles, eliminating the infection without the need for antibiotics or medications like Accutane. 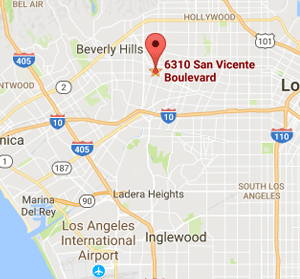 At AMA Regenerative Medicine & Skincare, each Laser Acne Treatment incorporates Aminolevulinic Acid (ALA) with each photodynamic treatment. ALA is naturally found within our skin, and has the ability to shut down the sebaceous glands just like Accutane, but without the medical risk or side effects. ALA is a clear solution that is applied to the skin and left on for 30-45 minutes (Incubation). Once absorbed into your skin the ALA is activated with a specific wavelength of light in the blue spectrum. This takes about 10-15 minutes. 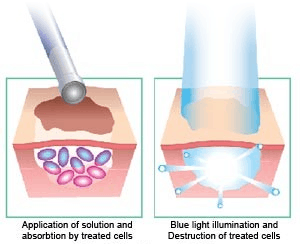 Active cells such as sebaceous glands absorb ALA and, consequently, when the ALA is activated by the blue light a patient’s overactive sebaceous glands will be dramatically impacted and shut down; hence the term “Photodynamic” acne treatment. Skin oiliness is decreased and the appearance of pores is minimized. The entire skin texture improves following a Photodynamic Acne Treatment. With the infection now in retreat, we use 1 or 2 additional lasers to shut down the inflammation that often accompanies acne and cystic acne. This will reduce swelling and remove redness and pigmentation. 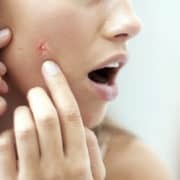 Just like Accutane, patients will experience a purging of the skin as a result of the sebaceous glands drying up and purging excess oils and inflamed bacteria, but will prove to reveal naturally clear skin within a couple weeks. 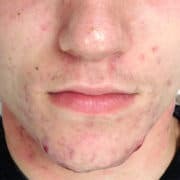 Before and After Laser Acne Treatment – Acne treatments with lasers do NOT have the negative side effects that Accutane does. In many cases, acne treatments are integrated with a package of silk peels (dermal infusion facials) administered by our Nurses. The Dermal Infusion procedure infuses into your dermis a natural substance called Salicylic acid, which is clinically proven to further reduce acne and cystic acne breakouts. In this procedure, a precise amount of the dead layer of your skin (Stratum Corneum) is also removed, which promotes further healing and rejuvenation of your skin to its silky smooth radiant state. In addition, the Nurse will customize an anti-acne daily skincare regimen for continued acne treatment maintenance. AMA Regenerative Medicine & Skincare truly believes that they have created one of the most comprehensive and effective ways to treat acne, and the proof comes from the incredible results that each of their acne patients have received.